So, the more Gems you purchase, the better value you get for your money. These new bundles also reflect an increase in Gem costs for all but the smallest package, as previously the largest Gem package you could purchase (1000 Gems) broke down to 5.6c per Gem. 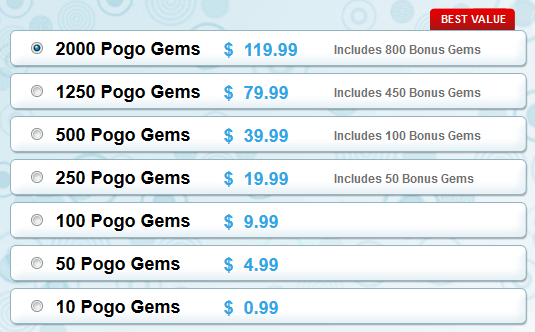 To see the packages for yourself, click on “Add Gems” in the upper right corner of Pogo.com or Club Pogo. Note: this change does not affect the EA Game cards or their value. Thanks to Debi for sending in the news! I literally bought gems (biggest old package) yesterday, because I had to buy all those Mix badges and got down to about 300 gems. Not overly thrilled, but will buy the largest package every couple of months (2,000 gems) instead of 1,000 every month. The increased cost, to me, will only be about $4 a month. Remember everyone, it’s not a requirement to purchase gems for anything. All gem purchases are for optional content. Thanks POGO. That increase is outrageous. This means no more Gems for me. I’m on a fixed income and I’m not spending 80 dollars for what I used to get for $56.00. I’m sure you are going to find that many more seniors will opt out of buying the gems now. always #3 – The cost for 1,000 gems is only $60 since 2,000 costs $120….as long as you buy the largest package. It was $56. for 1,000 gems, so an increase of $4 per 1,000. You can’t use the cost of the 1250 gem package, that’s like comparing apples to oranges. I always buy the 400 Gems for 24.99. Going to have to some thinking about this. Everything keeps going up and peeps on Social Security are not getting an increase in January. This is becoming an expensive hobby . Alot of people can’t afford spEnding over $100 on gems all at once like that . I agree with you alwaysyearly #3 . We are also in fixed income. Guess you know what this means, don’t you? Everything else is increasing in price, too, badges, albums and mini items will be jacked up soon. 😉 I am very close to abandoning my idea that Pogo is a fun place to play, people are going to be disgruntled and surly! Contemplating my future with Pogo right now, I’ve been an avid player for 7 years and am weary at this point in time. Mom #4. It’s not just about going up a few dollars, it’s about the initial layout of $120. Suz, I appreciate the breakdown mf but now I am FORCED NOT 2 buy gems as I’m on a really fixed income & my goodness there is no way I can afford these extremely high costs no way at all & w/o gems I can’t play pogo as buying from mini mall, badges etc. is what its all about 2 me & its terrible 2 do this right @Cmas time is horrible!! I’m mad & heartbroken over this as God knows I can’t afford these prices so gl 2 all on fixed incomes as they make up the largest population on pogo…happy holidays 2 all & my heart goes out 2 those of u like myself as this is a SHOCKER!! blessings & Merry Cmas ev1..Loretta 🙁 so sad about this I could cry & probably will…bless u all!!! Nothing stays the same forever and no one is forced into getting them. The biggest package always ends up the best value and if you are careful you can make them last out. For those on a strict budget there are a variety of packages to chose from. Correct me if I’m wrong.. but , 1000 gems used to be 56.00 bucks (55.99 ). Now, 1200 gems is 80.00 bucks (79.99). So! The additional 250 gems is costing 24.00 bucks ! That does not seem like a good deal to me. UGH! The best bet is to buy the 2000 gem pack for 120.00 (119.99) because if you divide that in half it’s 60.00 bucks for 1000 gems, which is still 4.00 over what they used to cost but probably the best deal of all offered if you buy a lot of gems like me. Pogo is getting rich off gems. I hope they don’t increase membership next. Lots of people can’t afford it. I have four accounts that i buy everything for. Just don’t know if i can keep them all up anymore. I may have to let some go sooner or later. Well well they really are desperate for money and is unerstandable. I rather have an increase in the yearly subscription, that would be a lot cheaper than having all these “small” increases here and there all over Pogo. This means I’m going to buy a lot less gems and will have to be extra careful about how I spend them. Or at least I will try. So, at this point I don’t mind much about the increase in the price but the increase of the package size. I’ve been on Social Security Disability for many years due to a neck & back injury that several surgeries were not able to correct. So I get 1 monthly check just like the rest of you. Because of my injury Pogo is my ONLY entertainment. Yes, I know we are not getting an increase this year, and it stinks. But it is what it is. I will find that extra $4 a month and put my $56 + $4 away until the next month, and then I’ll buy my gems. You can’t expect Pogo to be able to run on the same money they did last year. They have employees that expect a raise, no matter how small. Their utility bills will go up probably, maybe their rent also. And they are trying to keep the annual fee the same so that everyone can play. Do I agree with that? That’s not something I can say since I don’t have to pay an annual fee for many years to come b/c of the old coke rewards. So my saying to increase the base fee is just wrong since it wouldn’t affect me at all. And there are more people that don’t buy all the optional content than you think. A base fee increase would affect more people than increasing the gems. I had already stopped buying additional things on my 3rd account, and was probably going to stop buying extras on Holly’s account. That only leaves my main account, and I will continue like I am as long as I can. If it becomes too much I can start waiting for sales like a lot of people do, time will tell. But we can’t blame Pogo for trying to be a profitable part of the EA family. All businesses need to make money to stay in business. I would rather my gems go up 1/3 of a cent each than to not have Pogo at all. Well said, Mom/Suz, #19. Thank you. Guess this is a Merry Christmas gift to us from Pogo. I think this is awful doing it this month. Pogo could have at least waited to January to do the increase. I will start cutting back starting with the Mall and then M&Ms. I’m not at all thrilled about the price increase, but I do understand that prices can’t just stay the same. I think I’ll probably become much more conservative when spending my gems. I usually bought the 1000 gem package, but I just don’t know if I can make myself spend $80 at one time. ($80 just sounds so much more than $60). And, I don’t see myself being able to spend over $100 in one purchase. I guess only time will tell, but I think I’ll just be spending less and probably buying the $40 package and try to make those gems last as long as possible. I fully understand rising costs and that the company has to increase prices periodically to stay profitable. However, I wish they would have just done a small price increase on the existing packages rather than completely restructure them. Money is incredibly tight right now so I have a budget of 25 a month to get 400 gems. Now, there really isn’t a comparable package. So looks like I will just be getting 150 less gems per month. Its a shame as I couldn’t even keep up with the releases as they were. Now I will fall further behind. which would be $163 cnd. Thanks anyway!! I am thankful that pogo is making their money on these optional items and keeping the membership rates the same. I will take 3 years of membership and forego the gem purchases. Not a good time time to raise prices POGO. Stores are having huge sales this time of the month. Since I am on a fixed budget, and have not received a raise for cost of living in my pension, I will only be purchasing the 500 package every month as opposed to the 1000. Less money from me to POGO, extra money for me for entertainment other than pogo, every month! Your loss POGO, someone else’s gain!!! now hope still get whatever it was but it is what it is! why is it that every time pogo makes changes or does server maintenance they always manage to make thing worse? 400 gems for $24.99 was far better then the new $39.99 for 500 gems. that is $15 extra for the extra 100 gems, a total rip off. pogo tries to be slick saying only 7.9c per gem for 500 trying to make it look like its a cheap and sales price. yet you can get the same amount at the same price for the 250 package. An interesting announcement at this time of year! We in the UK pay far more for gems than the USA or other countries so this increase is even worse for us -so of course it is time to reflect on my on spending habits and perhaps be less generous and less assiduous in buying everything the moment it comes out like I do now. For those that have posted that Pogo is business etc etc and defended these increases I would point out that EA Games made a FOUR BILLION DOLLAR PROFIT last tax year and paid NO CORPORATION TAX on that profit because it has registered its place of business in Switzerland, so these increases have NOTHING to do with the viability of the company of its ability to pay employees or rent and rates, its just sheer profitering. The coin bucket and now this…kind of adding insult to injury. However I still believe it’s good entertainment for the money. Will still have enough to be busy with even with cutting back on spending. As of right now, if you use an EA card for $20, you still get 275 Gems, which is slightly better than spending $20 on a regular Gem purchase. Betting they will change this ASAP. The 2,000 per gem price is the same as the 1,000 was. eggfarmer #36 – I didn’t say that EA wasn’t profitable. What I said was that Pogo needed to be a profitable part of the EA family, 2 totally different things. stretchdogg #39 – The last time it took them a year or more to change the EA game cards, but if I had them I would enter them instead of holding them. I just remembered something…about a week ago I tried to do 2 transactions for 1,000 gems each and Pogo kept giving me an error message. I think I know why!!! They wanted it to wait till the price increase!! I have a Target Credit Card–a RedCard. Everything you buy at Target with the card is reduced automatically by 5-percent every time you use it. They have the EA cards there, so I always pick one up every time I shop there. I also use their pharmacy rewards–my daugher has epilepsy and her medication runs about $120 per month, so they send me rewards shopping cards every couple of months in the mail, which I use towards the EA cards as well. You either get an extra 5-percent off your total charge with the rewards for a total of 10-percent, or you get incentive bonus coupons–either $10-off if you spend $100 or $5-off if you spend $50. Because you can buy groceries there, and I have no problem using those–I can also pick up packs of socks and underwear, school supplies, cat food, etc. I am not an employee of Target, but with the Coke Rewards having gone away, this is the way I cut corners with the Gems. This is not a LITTLE increase based on my math. I to am on a fixed income and enjoy playing POGO, but increases in Gems and yearly membership fees is a bit much. Hope (but I doubt) they re-consider such a large increase. Bob #45 – There is NO increase in the annual membership fee. It’s still $40, the same amount that it’s been for at least 7 years, possibly more. It would be a good idea to to promote the entire site better so that more players could be enticed to join Pogo, and to hold back cost increases. Other than that perception, I will continue the same on all of my Pogo playing. I love it too much and I give my all to Pogo 😉 Always have and always will. Meh. I understand prices go up, and like Moms said, this is only a difference of a couple dollars a month if you are already buying all the badges. My only problem is that I’m kicking myself for not stocking up last night, when I noticed I was down to about 100 gems. Pogo is doing nothing but becoming a joke on the gem prices and now with the refills every 24 hours instead of every 4 hours … Getting to tight for my budget. Guess i’ll be spending my free time in Face book games since i have over 700 friends that keep sending me lives for free . The 5% Red Card discount and the Rx discounts at Target do NOT apply to gift card purchases. I’m sorry, I just have to say this. Having a computer and internet access are a luxury that many Americans can’t afford. Limited income? I think we should all be thankful for what we do have. Walk into a homeless shelter and complain about the cost of gems to a single mother with 3 kids. I don’t think she would sympathize. Sorry, it is how i feel. Ouch really ! The rest well you could not print it. Less gem buying here sorry. I get that everything goes up in money at some point or another. Though spending $120 at one time for something like gems is a lot to swallow. For me it would have been better to continue getting 1000 gems for $60. Yes, it’s still an increase but it’s more doable dollar wise at one time. I’m sure I will still buy gems, though I’m still not sure which package I will get. I do know for sure I will totally be cutting back on the amount of gems I spend, BIG time! You actually do get the 5% discount on the ea cards at Target. I’ve bought them many times and always get the discount. As many of you know I have been playing Pogo since before their was a “club”, m&m’s, albums, mini mall etc, so I have seen many changes, both good and bad. I understand decisions from the business side and also the financial side that we are all faced with. We all have to make a personal decision on how or if we are going to handle the increase and if we plan to continue on Pogo. I enjoyed (and still do) playing on Pogo before they added all the bells and whistles and sometimes I think we lose site of the fact it’s just a game site that could go away tomorrow and leave us with nothing tangible to show for our efforts but fond memories. Pogo is my main form of entertainment especially since I have retired and yes I buy gems. I won’t presume to justify Pogo’s decision with numbers etc., and I understand fixed income issues, we can just stretch our dollars so far. I, like most of you will have to decide what I want to do. POGO is becoming to rich for my blood. In 2014 I spent $939.24 for gems and membership. In 2015 I spent $1,323.72 for gems and membership. Also included in what I spent is 7% sales tax on everything. I now can only get 5,000 coins in 24 hours in the social slots where I use to get 7,000 every 4 hours. I loved POGO (past tense). I guess I’ll be playing other games in other web sites. I hope Gemboree will continue; it did say “first ever”, which I assume means there will be more. It wasn’t hard for me to rack up the necessary purchases to get 80 gems back, which I used for the next PBA. Yes, I’ll be waiting for more sales before I buy, and will have to keep close watch on the expiration dates. I wouldn’t be near as savvy without Lura and BH! WOW! I hear and agree with most who are upset BUT do understand that this is optional. HOWEVER as I’m Canadian, and right now our dollar is almost 35 cents less than ONE American dollar, thus cost of the largest package would be for ME, $184.91 CAD. That’s more than the cost of my TV/net/phone package / per month & even in toss in 2 days of food. I, too, am retired & on pension, so will def be buying less gems each year. Sad for me as I did enjoy the mix & PBA badges. Even the cost of membership for me is already $64.00/year. Wish there was some advance notice on this change as I would’ve bought the old package of 1000 gems for $84.00 (CAD). Now, I’ll have to settle for giving no gem gifts & even buying less for myself. I guess this increase as I DO BUY gems will mean less time again on Pogo. I cannot justify the expense of the increase for entertainment purposes & I, too, don’t get out much. #36 EGGFARMER. I do agree with you that the UK ppl get burned the most as I have 2 UK friends and you are so right that the gem packages are smaller for more pounds. #48 MILLIE, you are correct in seeing that less ppl are now playing Pogo than last year. I can attest to the Canasta rooms being so full (when I started) even back doors (b4 flash) didn’t even work. Now you can get in via front doors into all rooms BUT good luck even getting a game quickly. Maybe I’m the only who noticed the upstep in prices on the lower levels of purchase, albeit relatively miniscule! OK now I can type something that can be posted. I have a badge and mini item for almost anything you can think of. I have been spending way to much money on gems. Heck if they had a sale I would have ran. This makes me look at what I have spent and I could be doing something else. This money I spend could do more good. this is pretty brutal for me with the difference in the dollar right now, since the Canadian one is worth next to nothing…I felt the same with the old package, will be even more with the new one…even tho I know it’s optional…pogo is slowly heading down the dead end path for me, and may have to think of a new hobby come renewal time, as much as I love my games. I am not happy about the new gem packages.before the gem package increase I would purchase 400 gems for $19.99 ,now is cut almost in half 250 gems for $19.99. In defense of pogo we have not have an increase in gems in awhile. Does anyone know when the last change in gem packages? I have not brought any gems in awhile,hopefully soon. kathy: the last update to Gem packages happened on March 26, 2013.
mspatmac — #58….. So well put! Thanks Lura for information. It’s been over two years since we have any increase . It’s not too bad considering pogo has not raised our price of membership to play the games and enjoy the benefits of this gamesite in awhile.we should be thankful . I’m on a fixed income and it hasnt gone up so I guess I wont be buying many gems anymore. There are other sites where gems arent required to play the games you like(as in CLUE and some others). I enjoy the chats in the rooms where they still exist. I love HOGs. I’m not buying gems any longer; I assumed the gemboree was going to be followed by a price hike. Since I enjoy HOGS and don’t want to buy them, I use one browser to play the free ones that are all over the Internet and minimize the windows so I can use a different browser and be in a favorite pogo room where the folks are wonderful & chat is lively. The two minimized windows offer me the best. If pogo/ea hadn’t been so dismissive of customers, I would support their price increases. Used to be a person-friendly site; now it’s a site that erases perks, preys on people, and treats customers as if we were brainless twits. I don’t even mind seeing people use cheat programs any longer – used to bug me, but now, perhaps it’s pogo’s kharma. I don’t like it. They took away the package I bought, which was 400 or 450 gems for 24.99 – however many gems, I bought the 25 dollar package. I suppose I will just knock myself down to the $20 package – but will only buy gems as often as I used to, so Pogo’s losing from me, really. nyc #63— I’ve been a social worker for years and my sensitivity doesn’t change through the seasons, but , thanks for your concern. We all should feel so lucky and blessed. (every month). Pogo can do what they want, and we can choose to pay or not to pay. My disappointment is with their timing. They know we will want to take advantage of all the sales that are coming up with the 12 days till Christmas, which is something we all look forward to all year. Pogo giveth with one hand and taketh with the other. I am SO THANKFUL that I bought the largest OLD package yesterday, because I had spent just over 800 gems during the Gemboree Madness! For once, and in my life it’s rare, I spent my $$ at the right time!! Yes, I know they need to make more money to stay in business and I guess the 0.3c increase per gem isn’t as bad as it seems…I think it’s the quantities they’re selling them at is the startling factor to most people. I’ll buy the max. about every 2 months, and will budget for it. I agree with so many people here about the increase. I also live on SS. and some people get a lot more per month then others, so that makes a big difference on what some people can afford. I can hardly meet everything as it is, and now most of the newer games.. they want you to buy “powerups” which are gems. I have spent more money on gems in the past few months since ME came out, but I have got to the point where when I can’t win a game without using a gem, I’m not using them very often. Just saying to heck with it and go on. I’ve played some of those games over and over for two weeks and never finished on time. For some reason my time is always off by 1or 2 seconds, which if it went by the time at the top of the page it would be won, but down below it always shows 1more second and very often that makes the deal of not winning. I’m tired of so many games needing gems now. It’s ridiculous. Also, the parlor games are another trick. I spent 30,000 today and between Chuzzle and Peggle, I didn’t get one Chuzzle or Peggle fever. So they have done something to those games too. I had some coke subscriptions for 3 more years, but mine all vanished the beginning of this year. I called Coke and they told me they were taken off in January of this year so starting January of 2016 the subscription people had would no longer work because Pogo didn’t want to use them anymore. So are Some people still going to have free subscriptions while others lose them, starting 2016? I love to play the games on Pogo, but getting to expensive, especially if it’s a game I really like to play but can’t win without gems!! Good Grief Charlie Brown Merry Christmas!! Not biting the bait for this one. Way to much money at once. I enjoy Pogo a lot but would rather spend 119.99 in the real world. Pogo is going to lose business this way. I love my badges, but also enjoy just playing for ranks. i feel this increase is terrible been buying gems for quite awhile im on a fixed icome & i bought the 400 a month witch i was ok with but now with that increase means i cant afford it no more, its going to be ur loss cos alot of us are on fixed incomes & we dont even get a increase this year on SS. I understand the annoyance, I understand the frustration, but pogo is my only release, when I get sick I can play pogo while doing my meds and neb and breathe easy. We need to bear in mind that pogo is based on california and cali hicked taxes a LOT this year. So what cost 8 bucks to do before probably does cost them 10-12 to do now. It doesn’t relieve the sting of the cost increase to us, but it does explain the frustration that the business must feel, if they don’t raise costs how can they stay in business? If they do how can they stay in business when people leave? I don’t like the increase, but pogo still is the only place I really find my peace with my health issues. Kathy, I would think so, the 19.99 package was under the old system they removed a couple years ago, the packs we have been buying are 14.99 and 24.99 and it was the 24.99 that had 400. it still stings but it is not as big as it seems. Moms/Suz (19) – well said. So many people seem to want more money while, at the same time, want goods to remain at the same price (or even lower). Pogo have to pay bills just like the rest of us – and pay staff as well. ben (15) Thanks for working out the UK price – saves me doing it. Lol. I might be a bit more wary about buying the maximum amount as it`s a lot of money to pay out in one go but, as you say, it`s not a vast rise in general. I am on limited income as well so have to be a bit careful, but I spend carefully, generally waiting for sales. The top amount would probably last me at least 3 – 4 months as I only buy what I really like. Pogo went nuts. I will not buy gems any more. Pogo gets our membership to play games then charges us to play some games and get powerups. Ridiculous. I am feeling mad about it all. grameeh #78 – If you had multiple coke rewards and add them to your Pogo account they should still be them, just look at your “paid thru” date. In the beginning there was no limit on how many Pogo rewards you could get a year, so I kept getting them and adding them. That’s why my accounts are paid thru 2025. Yesterday brought me a new friend on Pogo because of her post on Badge Hungry! These statements are what illuminated the kind of person she truly is: “One thing I won’t do is dismiss your concerns. Do what’s best for you as I will do what works for me. Merry Christmas and hope the New year brings health and happiness and some gems won in the games. Pat <3"
She didn't brag or make herself look better than anyone else on this thread and I truly applaud her for her kindness to mankind! Thank you, Pat #58, Pogo needs more like you. I read this and I haven’t posted until I understood it fully (took many pot’s of coffee) ! Everything goes up : Grocery Store, Rent, Elec Bills etc. But, Pogo is my only entertainment and it is worth it to me to get & gift what I truly like in the Mall that costs (pennies) if they are Gem items. Using the M/Magic for 8 Gem turn is a deal for me and the Holidays are coming up anyway, so I’d like to get the new or re-released older things I never had. I have only posted a few comments over the years because one of you always said what i thought UNTIL now. I do not understand why you are all so accepting of this absolutely ridiculous gem price hike. I can understand the rates if we were paying for them to dig them from the ground or manufacture them from the earth but we are talking Digital Gems here. I love POGO and I love gems but why do they need to raise the price so much?? Many of us voiced our opinions and signed petitions and fought really hard just to get Spooky Slots back and finally POGO said “We heard You”. I for one will take a stand and I for one will not buy any gem items, badges or specials as of today. We have to draw the lines somewhere and I am not planning on leaving POGO because I love it BUT enough is enough. Can You not imagine what boycotting gem items or badges would do??? I know I am going to lose things i really want but what i want more is for POGO to quit seeing us as lemmings and as people . WELP, I guess I wont be buying any more gems, with the Canadian $ at all time low..I bought 1000 the other day for $50 something which worked out to just over $80 !!! In my opinion, pogo chose one of the worst times of the year to roll out this change. If I recall correctly, the last update to the gem packages led to a decrease in the price per gem in the largest bulk package. I understand the need to raise prices for revenue to provide all customers with an enjoyable online gaming experience. I wish they had kept the same packages and implemented an across-the-board price increase. Without BadgeHungry, I would have no idea that the largest gem package is more expensive per gem than the previous gem package. Like the new free coin collection system, I do not come to a gaming site to perform mundane calculations to understand the quantity and value of the new changes. Will I buy the largest gem package in the near future? I have 825 gems now and we buy many pogo extras, so I will eventually buy more. I will cut back on animated mini items. Unless I absolutely love it and just gotta have it, they can stay in the mini mall. As for badges, I will do what I have always done, wait for a sale or until the badge’s retirement to buy them. I always buy HOG episodes and Mahjong Escape power-ups on sale. I love pogo, but like the parlour games, they have handled this change in a most confusing manner. I certainly hope that pogo does not want to confuse us. That is terrible customer service. I do admit I do buy a tun of gems on a bunch of accounts. its 275 for 20 bucks as opposed to 250 for 20 bucks. Wow, less for more! What a concept. a lot of people like me cant afford the $the 120.00 for gems. baddog: well that disclaimer is almost 9 years old. Guess I should get an update now that Pogo is clearly linking to this fan site! 🙂 Anyway, welcome to you. Glad you’re here! is anyone not getting credit in Sweet Tooth for Weekly Challenge or Personal Badge in todays game besides me? Can someone tell me how this affects the EA Game Cards bought at GameStop? Will they still be selling them or will those change also? I have a digital code for Best Buy and was going to use it towards an EA game card, but they no longer show the one with the “I love pogo” shirt. They have an EA “cash card” which has a mostly orange background. Does anyone know if this is good for gems? Thanks! sisterfifi #100 – If you go to the Mini Mall link to add an EA game card it shows you the 2 different cards that will work to purchase gems….. I purchased 2 x $20 EA gift cards at Game Stop yesterday, and cashed them in for 275 x 2. Pogo hasn’t changed that yet. My own situation, I use United Airlines App, purchase a gift card for Game Stop, and get 4 x the amount in United Airlines Miles. Easy to collect 160 miles that way. But that’s just me. Thanks. Some GameStops don’t carry the EA Game Card anymore. I know of one that does so I may get a couple while I can. They’re getting hard to find. Nancy: I wrote this guide about gifting, but you can get them for yourself too of course! And it’s instant delivery. Nancy #103 – You can always get them on Walmart.com and they will email the code to you the same day. Thanks Moms & Lura. I haven’t been able to find them in Wal-Mart or Target lately, they used to carry them but not any more, atleast not around here. Atleast there’s still ways to get them, thanks for the help. I ordered something else last night and had no trouble. Does anyone know what I’m doing wrong? I live in NY. I was a little upset when I bought gems yesterday, but over it now. They should have given a warning, but I guess they figured pogo players would stock up before the price increase. I would have. I was upset with the prices because because I just finished Christmas shopping, etc, and I don’t have $120 at the moment. This is just a form of entertainment, all is optional for us to buy or not to buy. Still cheaper to play games with friends on pogo every night than meet them for movies and/or dinner, etc for one night. I, however, have animated backgrounds for all 4 seasons that I like. Will not be buying anymore, saving gems there. I also alreay learned to be patient (was hard to do, and still hard to do) until badges, pba, HOG episodes, etc go on sale. Been saving gems there too. I haven’t paid full price on anything since spring! I know some players complete every badge and has compleated every badge as soon as it’s out, so waiting for a sale wouldn’t work for them. Plus, I don’t care for certain games, so I may start not purchasing pba’s if I don’t like all the games. With the insane price increase, I will definitely be cutting back on M&Ms and cease from buying items which require gems at the mall. If the gem packages have increased is this a sign the membership is likely to increase?